Can I File a Lawsuit and Should I Hire a Bicycle Accident Lawyer? Yes, you can file a lawsuit if you were injured while riding a bicycle and there is evidence that the driver of another vehicle was at fault. For example, attorney Brendan Flaherty represented a man who was hit by a driver who was reading a map at the time of the collision. Brendan’s client suffered a pelvic fracture, which is an extremely painful injury that can be fatal. It almost always causes some degree of permanent injury. Brendan helped his client win a significant settlement. Attorney Brendan Flaherty inspecting a truck that has been in a crash. You can contact Brendan at 612-338-0202.
have confidence to aggressively pursue compensation for you and your family. $6 million for a family with a wrongful death claim. Pritzker Hageman, a Minnesota personal injury law firm, donated money to Keystone Community Services, a St. Paul, MN charity that funds Express Bike Shop, which hires disadvantaged youth to learn how to repair and sell bikes, and to gain business experience. These are paid internships. The money donated by our law firm will be used to provide free helmets and to fund an intern scholarship. Disadvantaged youth receive paid internships at the bike shop and learn how to repair and sell bikes and gain business experience. The bikes they fix up are sold inexpensively to local families who receive a well maintained bike at low cost. Attorneys Eric Hageman and Fred Pritzker represented the family of a 53-year old bicyclist who was killed when she was run over by the trailer wheels of a right-turning semi truck at a busy intersection. The police report indicated that the bicyclist was at fault and the truck driver was not. Pritzker and Hageman took the case, did their own investigation, and discovered evidence that would help them win the case. The video below was used for this case. Unfortunately, many bicycle crashes involve inattentive drivers. In most cases, the driver’s fault consists of failing to yield to the cyclist, backing out of a driveway, opening a car door as a cyclist rides by, running a stop sign, driving under the influence of drugs or alcohol, or simple inattentiveness. If you have been injured by a distracted driver, you can hold them responsible for their actions by filing a lawsuit. For your attorneys to determine what your case is worth, they have to look at many factors. Our lawyers consult with our clients to understand the effect of the crash on their life, and with medical professionals to determine many costs associated with specific injuries. Can I Sue a Truck Driver? Yes, you can sue a company truck driver for personal injury or wrongful death. You may also have a lawsuit against the trucking company and owner of the freight being transported. Our law firm has handled several cases where a left-turning truck injured or killed someone. One of these cases was discussed above, another involved a dump truck turning in Dinkytown (U of M Minneapolis area). The cyclist, a U of M student, was in the bike lane and had the right-of-way. It was a tragic, senseless loss of life. We have also had cases where a trucker was distracted by a cell phone, map, and other distractions. In one of our cases, the driver stopped illegally in the middle of the road because he was having an argument with his girlfriend on his cell phone. 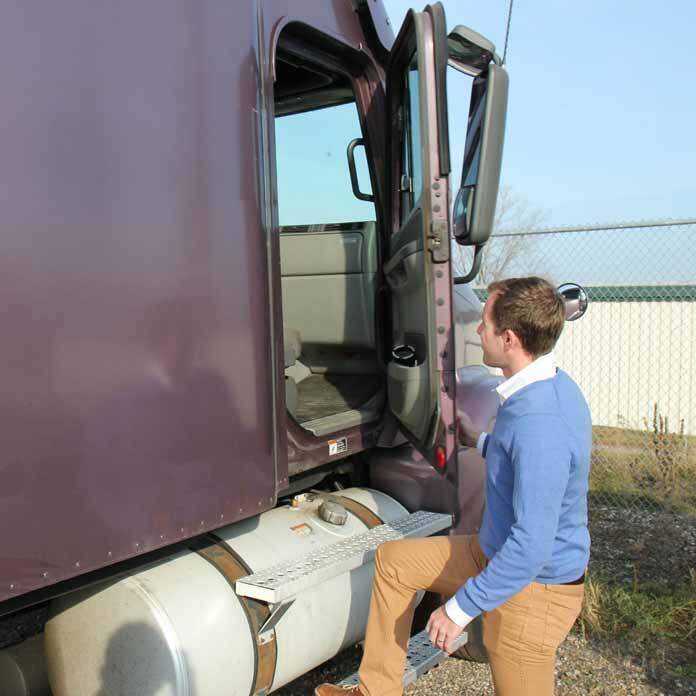 PH Law Firm attorney Brendan Flaherty inspects a truck that was involved in a crash. Can I Sue a Bus Driver? Yes, you can sue a bus driver if there is sufficient evidence that he or she was at fault. You will also have a claim against the company. Our experience is that most cases where a bus driver runs over a bicyclist or pedestrian involve bus driver distraction. In one of our past cases, the bus driver looked back to respond to a bus passenger just as the driver was making a left turn. Yes, you can sue if you were injured on a recalled bike if there is evidence that your bike had the design or manufacturing defect that was the subject of the recall. When a defective bicycle causes injury, it is called a product liability case. You can sue the manufacturer of the bicycle and possibly others for your medical expenses, pain and suffering, and other damages. Attorney Fred Pritzker won a case where a man lost his leg in a crash after a recall. You may also have a case if there is evidence of a defect, even without a recall. These can be extremely hard cases to win. As a former triathlete, attorney Fred Pritzker has a strong understanding of the safety concerns and the possible risk of injury when riding on the road. This understanding has helped him successfully win large settlements and verdicts for clients involved in bicycle collisions. Fred has worked as an Attorney for over 30 years and has recovered millions of dollars for crash victims. In recognition of his achievements, he has been named a Super Lawyer and was selected by other lawyers for inclusion in The Best Lawyers in America. For your medical problems, see a doctor as soon as possible. An injury can be underestimated. You may feel fine now, but some injuries, particularly neck, back, and head injuries, can become quite painful and debilitating in the long-term. Get as much information as you can. Key items include the names, phone numbers, and addresses of all the people involved, including witnesses. You will also need to keep track of insurance information and the reporting process. Make copies. Do not talk to anyone about the incident other than law enforcement personnel. Anything you say to insurance company representatives or investigators could make it harder for you to settle your claim. It is also a good idea not to sign anything, particularly some kind of release form, without talking to an attorney first. This is just a smart way for you to protect yourself. Minnesota Cities and Counties: Twin Cities, Minneapolis, St. Paul, Rochester, Duluth, Moorhead, Mankato, Brainerd, Bloomington, Eagan, Eden Prarie, Apple Valley, Maple Grove, Edina, Plymouth, Minnetonka, Stillwater, Thief River Falls, Bemidji, Grand Rapids, Austin, Worthington, Woodbury, Maplewood, Golden Valley, Shoreview, Blaine, Anoka, South St. Paul, White Bear Lake, Roseville, St. Cloud, Arden Hills, Brooklyn Park, Forest Lake, Winona, Hennepin County, Ramsey County, Washington County, Dakota County.